You will earn 465.09 Reward Points. Earn 1 reward point for every 1 dollar spent. 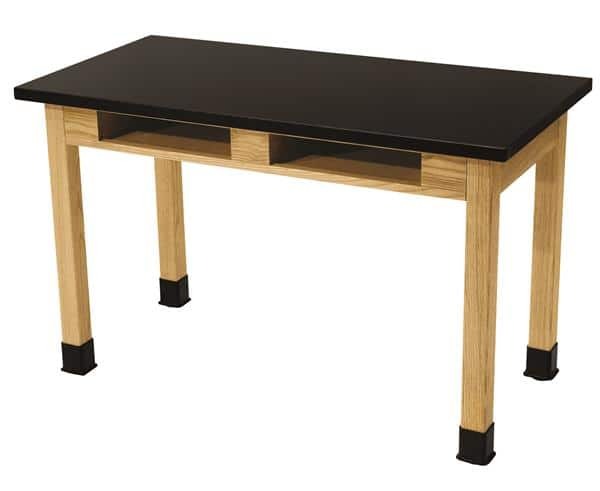 The NPS SLT Science Lab Tables with Book Compartments have "perfect chemistry" with any science classroom. These paragons of endurance are built with solid ash framework, side panels and legs beneath a thick "Chem-Res" tabletop with a MDF core. The work surface is of solid black, firmly secured, high-pressure laminate, resistant to water and 13 commonly-used laboratory chemicals. Includes two storage compartments with the option of concealment with the included side-panel aprons. Robust legs are spot-welded to the frame with metal-on-metal double-bolts on 13-gauge steel corner braces for maximal strength and durability. Feet are outfitted with rubber liquid-protective boots and adjustable glides for accurate floor leveling. The SLT meets MAS Certified Green environmental industrial standards.